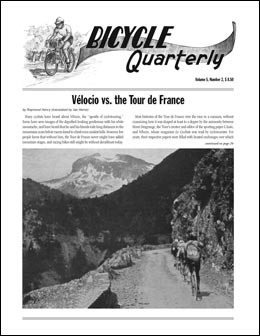 BQ contributor Raymond Henry completed his great tome on Vélocio, the “apostle of cyclotouring,” and we use the opportunity to bring you the story of how Vélocio battled with Henri Desgrange, the founder of the Tour de France. The issue was whether “real men” rode single-speeds or had multiple gears. Desgrange believed that real men chose their gear once and for all. Vélocio pointed out that the racers either walked up the hills or exchanged their bikes at the bottom of steep ascents for machines with smaller gearing. Desgrange was backed by the bicycle industry, which wanted to sell easy-to-make single-speed bicycles, while Vélocio represented cyclotourists, who demanded machines better-suited to riding in the mountains. We tested the Kogswell Porteur/Randonneur, which allowed hundreds of riders to try out 650B wheels and low-trail geometries for themselves, greatly helping with getting these ideas accepted. We also feature a fixed-gear René Herse winter training bike, which confusingly carried the downtube logos of Cycles Alex Singer. Our “Randonneuring Basics” article talks about training for long-distance events, while Mark Vande Kamp explains why slower riders really have to work harder than faster ones.